DMG Consumer Info Radio Show - Why Us? Debby Thomas-Jupiter, International Marketing Director/Talk Show Host of DMG Consumer Info Radio Show, and CEO of DMG International Enterprises, hosted a consumer info radio show, before Hurricane Katrina in New Orleans, LA. After Hurricane Katrina, she was forced to relocate her family and business to the Chicago area, where her immediate family still lived. It has been her dream to re-create this important media radio show, using the technology of iHeartMedia,Inc Radio Syndication! "We're coming back bigger and stronger!" First of all, we plan to broadcast the show via iHeart Radio Syndication, which will extend to Chicago, New Orleans, Los Angeles, New York City, Atlanta, Detroit, Memphis, Nashville, Houston, and Dallas-Fort Worth radio marketing areas, to name a few . Our company, previously hosted a 60 minute consumer information radio show for the Christian Community within the New Orleans Metropolitan area for eight years. We kept the Christian Community, especially our senior citizens, informed about everything from new technology, computers, legal tips, business opportunities to government programs available, to name a few subjects. Our company's greatest accomplishment was being able to help small businesses receive advertising exposure within the community for an affordable cost! We have chosen to work with iHeartMedia,Inc, because they have over 245 million monthly listeners in all radio genres in the United States, alone! In addition, iHeartMedia,Inc has the largest reach of any radio and television outlet in America! This is the way to Jump Start your business, by advertising in several radio markets at one time! DMG Consumer Info Radio Show will be providing advertising opportunities for companies interested in presenting their goods and services to the entire radio listening community via iHeartMedia,Inc radio stations. and the 'know-how' to begin, again! It is our mission to keep consumers informed about the changes that are occuring in the 21st century! Senior citizens, especially, need to be kept informed about the new advances in technology and government benefits that may be available to them in their 'Golden Years'. In addition, it is our mission to help small businesses STAY in business! 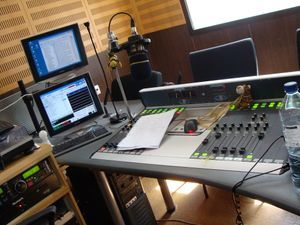 We believe that Radio Advertising in several cities, at one time, is the key. Successful marketing occurs when you increase your advertising markets. We believe that it is a numbers game, when you desire to become a success in business. Consistent advertising is the key to your company's success! It has been proven, by marketing experts, that if a consumer hears or sees a commercial, at least, seven (7) times, they will, eventually, become your customer! In other words, the more people, who hear about your goods and services, the more customers you will acquire! We believe that advertising on the radio, on the internet, and on social media is PRICELESS! We invite you to join our team, if success is what you desire for your business!